The Australasian Bluegrass and Old Time Music Association formed in 2013 to support musicians and festivals keeping these beautiful musical traditions alive. You can show your support by becoming an ABOTMA Member. Membership is only $25, and with it you’ll get $35 off your Mountaingrass ticket, so it’s a bargain! Mountaingrass tickets go on sale August 1st. After agonising deliberations, our program committee has whittled down the outstanding list of 70 applications to 20 accepted acts. It has not been easy. The quality of the applicants was simply phenomenal and we wish we could have all of them on the program. Notifications to artists will go out this week and we will start announcing them to you as the acceptances come back. It is not too late to have your say what you’d like to see at Mountaingrass, and get from ABOTMA. Won’t you take a very few moments and give us your opinion? It would be very much appreciated. And as a special incentive, everyone who responds goes in to a draw to win a special prize! The ABOTMA Committee would like to thank Greg McGrath for his contributions to the establishment of ABOTMA, and his many years of advocacy for the bluegrass and old time music communities in Australasia with his Australian Bluegrass Blog. In recognition of his support and achievements, Greg has been made a life member of ABOTMA. From all the executive committee, thank you, Greg, for all your technical expertise, your kind and wise advice, and your sense of humour. We hope you are enjoying the retired life! We are mourning the passing of Ralph Stanley, who left this earth for the angle band in June. Few voices are so uniquely associated with Bluegrass music, and his contributions to the genre will be treasured always. 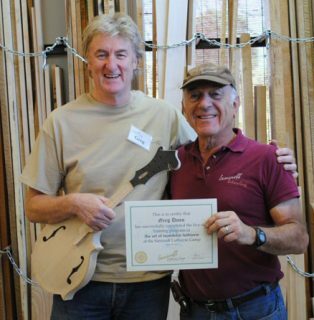 Greg is a luthier from Brisbane, QLD. He trained under Roger Siminoff in California, USA. Greg’s mandolin’s were well received at Mountaingrass 2015, especially when Chris Henry played his A5 at his Monroe Mandolin workshop on the Sunday. He received an order for a custom-built F5 mandolin at the festival, to be made ready by the next Mountaingrass. You can see a video of Mick Patrick from the great Australian bluegrass band, “The Company” playing a few of Greg’s mandolins at his website, http://www.dunnmandolins.com.au/.